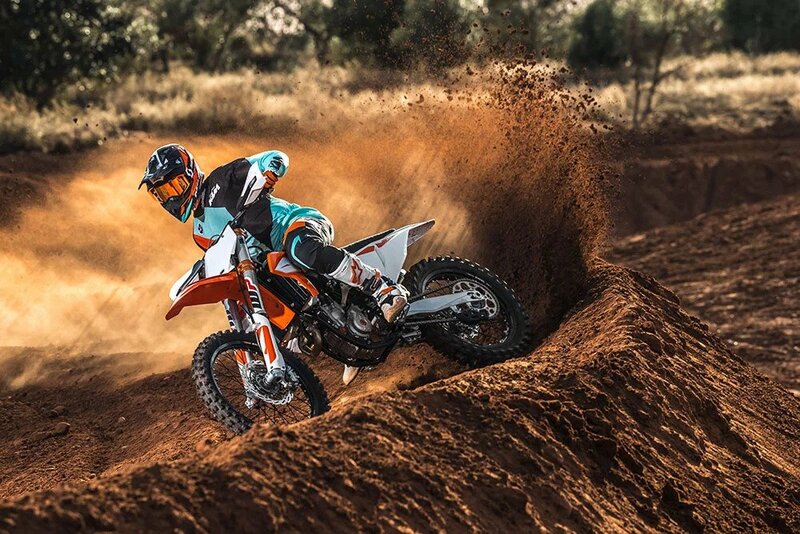 The KTM 350 SX-F's crankshaft features a stiff design and utilizes a short, lightweight connecting rod, contributing to the incredibly dynamic and efficient power delivery. The big end bearing features two force-fitted bearing shells, which run directly on the crank pin. This design is a prerequisite for the extremely high engine speed levels and the unrivalled power of the 350cc. 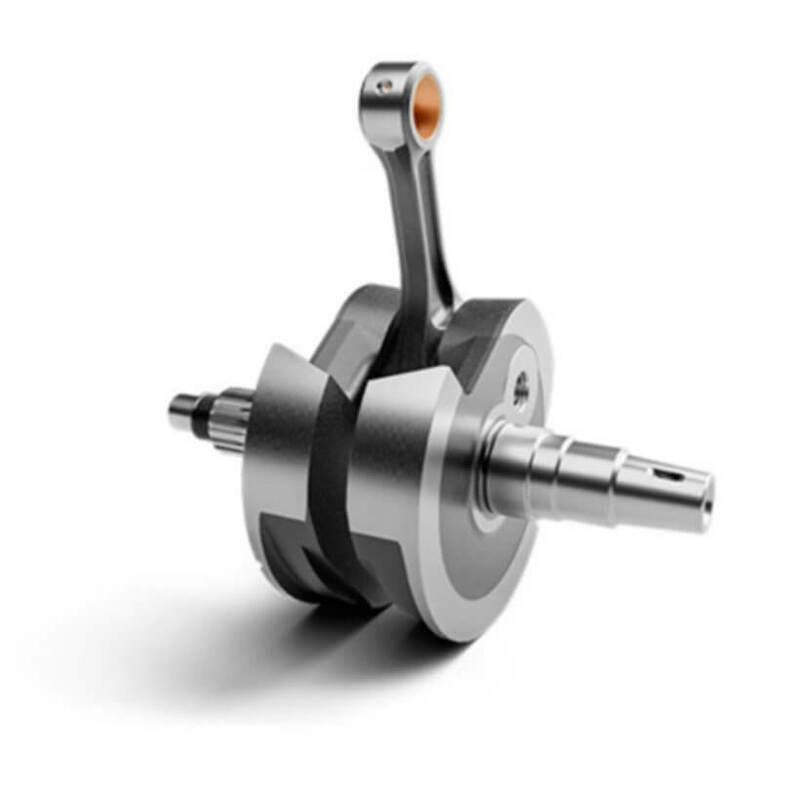 The design also enhances durability, allowing for long crankshaft service intervals - resulting in less effort and cost and more time spent on two wheels. The cylinder head on the KTM 350 SX-F is the gateway to its excellent power. For 2019, it has been reworked to further improve performance, as well as reduce the weight by an incredible 200 g. It features two overhead camshafts with a friction-optimized super-fine surface, connected to DLC coated finger followers, which activate four lightweight titanium valves (intake 36.3 mm, exhaust 29.1 mm). KTM engineers worked their magic to maximize the flow rate, resulting in optimal power band, with outstanding performance across the entire 13,400 rpm range. When it comes to improved power delivery and performance, the new exhaust on all 4-stroke models play a key role and packs a punch that is hard to beat. It features a new, model-specific header pipe with a further advanced resonator called FDH (Flow Design Header), which is a small chamber around the pipe. The silencer has a new profile aluminium sleeve and a new end cap, as well as a reworked internal design. The new shape allows the exhaust to be disassembled without removing the shock absorber and also provides better access to the shock. Another benefit of the new shape is slimmer ergonomics, making the bike feel narrower, without compromise to regulatory noise limits. Like the rest of the SX range, the frame on the KTM 350 SX-F is professionally crafted from hydro formed Chromium Molybdenum steel tubes. The frame is robot welded to ensure the highest levels of consistent quality. The frame stiffness was improved for more nimble handling, while improved synergy with the suspension ensures excellent high-speed stability. The frame features "nodirt" footpegs with a simple but effective self-cleaning system that ensures the footpegs return to their original position, for total control in all conditions. On all the 4-stroke frames, three new brackets allow an optional composite skid plate which is offered in the KTM PowerParts program, to be fitted. 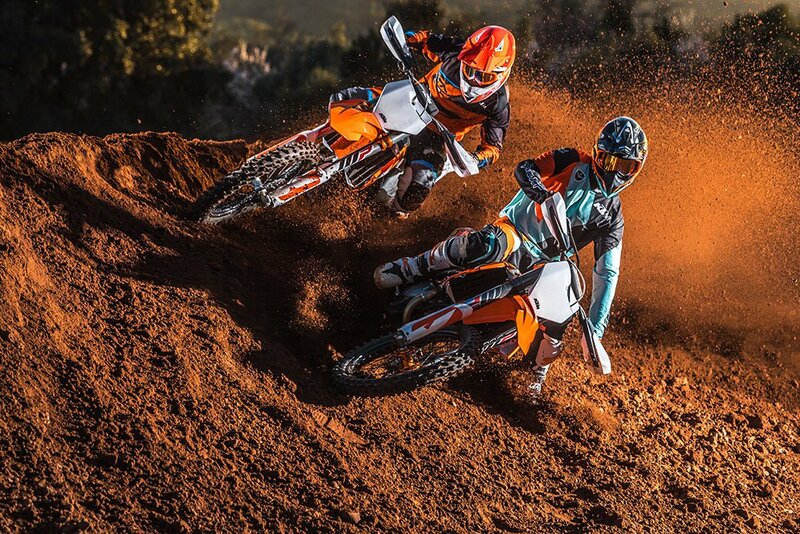 The 2019 SX range frames feature the highly durable powder coating featured on the KTM Factory machines and come with standard frame protectors. The updated subframe is 40 mm longer and made from lightweight aluminium. It provides improved rear fender stability and easier movement across the seat. The new airbox on the KTM 350 SX-F has been completely reworked to ensure better flow dynamics, and together with new intake snorkels, leads to optimal power and throttle response. Despite the obvious performance enhancements, the new design also offers maximum protection against soiling of the air filter. The large Twin-Air air filter is mounted on a cleverly designed stiff cage that minimizes incorrect installation. As found on previous models, filter maintenance is quick and easy and does not require tools - a standard, original feature from KTM. All full-size SX models are equipped with the same high-strength aluminum tapered handlebar, made by NEKEN. The handlebar is fixed in rubber damped mountings, which allow for two different positions. The handlebars come standard with an ODI vulcanized grip on the right side and a comfortable ODI lock-on grip, which does not require any wire or glue, on the left. They also feature a reworked bar-pad with a newly designed cover that can be attached and removed a lot quicker and easier. These handlebars allow the rider to hold on to this bike's 450-like power, while riding it like a 250. Sophisticated 'No Dirt' footpegs prevent clogging of the footpeg pivot, even when digging in deep ruts. Looking for a higher riding position? Then just mount the footpegs of the MY2018 EXC models, which are 6mm higher than the SX versions. 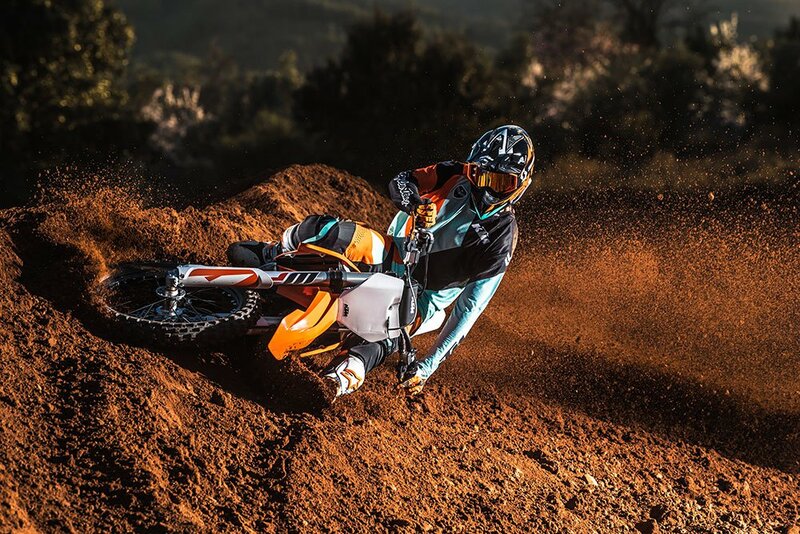 The KTM 350 SX-F is now fitted with a new, more robust 5-speed transmission. The gear ratios were carried over from the predecessor, but all the gears feature improvements and reinforcements. Another highlight of the transmission is the no dirt gear shifter. Similar to the footpeg design, it prevents the build-up of dirt and ensures the next gear is always available, no matter what the conditions. The state-of-the-art Keihin Engine Management System, with electronic fuel injection, features a new 44 mm throttle body. The injector position is unique and guarantees optimal atomization of the fuel and air on the way to the combustion chamber, resulting in instant response and maximum performance when opening the throttle. There are also separate systems for cold starting and idle adjustment, while an improved seal of the MAP sensor (MAP = Manifold-Absolute-Pressure) makes the system even more reliable. A reworked throttle cable mount allows for easy access and smoother routing of the cables. Additionally for 2019, the ECU features new maps which have been adapted to the new exhaust and cylinder head, regulating traction and launch control. It also provides different maps for each gear, according to the information received from the gear sensor, ensuring maximum power as you shift through the gears. The 88 mm bore cylinder houses a lightweight, forged, bridged, box-type piston, made to the highest standards by CP. It has an extremely rigid structure and features a unique crown shape to suit the high-compression combustion chamber. The compression ratio is at 14:1 and thanks to the combination of low oscillating masses, the engine displays extremely lively characteristics. 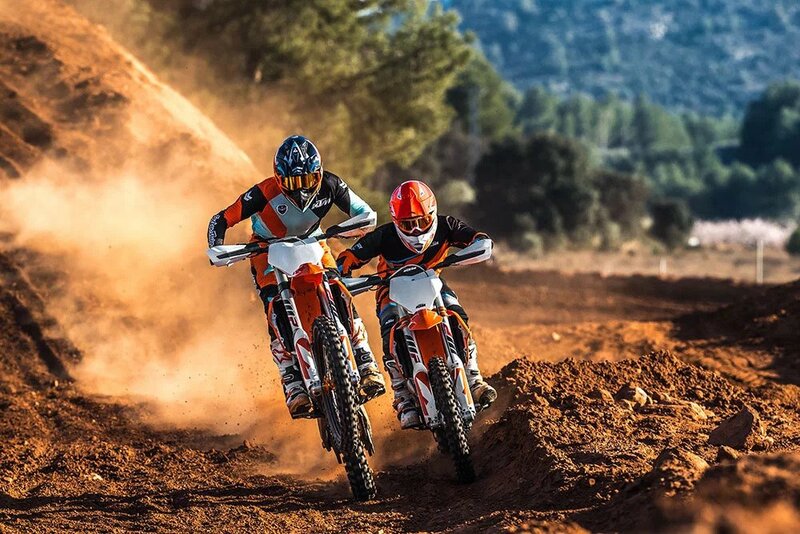 The high engine speed of the KTM 350 SX-F produces a significant amount of inertia. To counter these mass-forces, the engine is fitted with a multifunctional counter balance shaft. It effectively reduces vibration, as well as drives the water pump and timing chain. A newly developed DS (diaphragm steel) clutch, literally puts the control back in the hands of the rider. It features a durable, one-piece clutch basket and primary gear, made of high-strength billet steel, guaranteeing unbeatable reliability. It is fitted with extremely heat-resistant steel carrier friction discs, which are pre-tensioned by means of a diaphragm spring, ensuring the most effective disengagement of the clutch. This design substantially reduces the operating force required to pull the clutch and is made even easier with the Brembo hydraulic system. 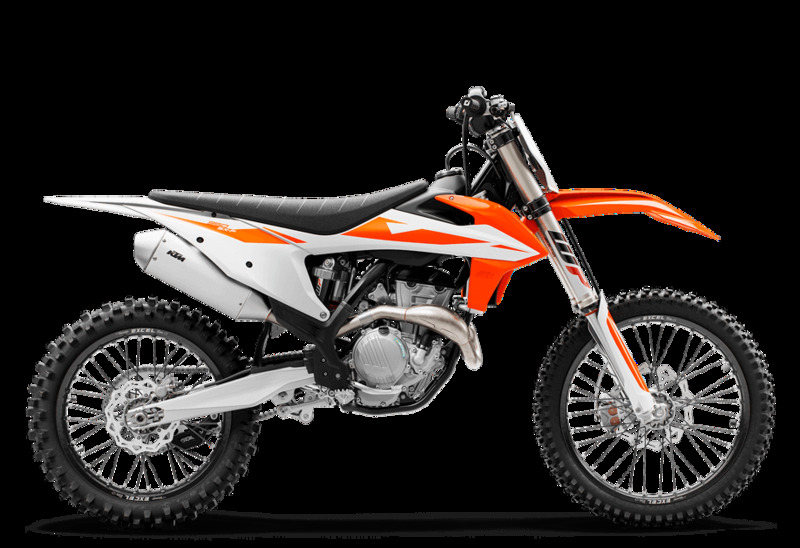 The standard electric starter on the KTM 350 SX-F uses a proven starter drive and a strong starter motor made by Mitsuba. It provides quick and reliable starting, saving you precious time and energy when you need it most, always ensuring the strongest possible race finish. Within easy reach of the left grip on all four-stroke models, is a multifunctional handlebar map switch, which features the innovative control functions; traction control; launch control and alternative power curves (standard <-> advanced). The TRACTION CONTROL is a unique feature which has a new setting for 2019. It guarantees more efficient traction and better control when accelerating the bike, especially in challenging track conditions. It can be activated on the handlebar map switch while riding. With a simple push of the two buttons at idle speed, the rider can also activate LAUNCH CONTROL, ensuring the most effective launch out of the gate. Thanks to a reworked set-up, the Launch Control now benefits from directly from the Traction Control, reducing wheel spin for maximum possible traction. The map switch also gives the rider the chance to select an alternative power map, besides the standard configuration, providing him with options during the race.